Well, it's St. Patrick's Day, and I'm sitting here at home with the Littlest Fando (who's under the weather). I'm wearing my Celtic jersey (the Arsenal ones are a mite short on green) and the "It's a blessing to be Irish" flip-flops that my in-laws got me for my birthday. So, what better time for the semi-annual tradition where I pass along some tips for those of you heading out this evening for a bit of libation and celebration. * Éirinn go Brách! Don't try to speak Irish Gaelic after you've had a few pints of Guinness. Even native Irish speakers have physically injured themselves in the attempt. Traditionally, one must wear green on St. Patrick's Day. Drinking until you turn green doesn't count. Irish dancing is a time-honoured tradition, requiring discipline, skill, and rhythm. Flailing and stomping about whilst shouting "I'm the Lord of the Riverdance! "** will only get you beaten up by spry little Irish girls who know better and can stomp like pachyderms, from years of real Irish dancing. Yes, the Irish sometimes wear kilts, but it's more of a Scots thing. The idea of "kilts and nothing more" is more an "exhibitionist" thing, so put on a pair of boxers, pervs. Jokes about "bangers" fall into the same category. Bangers are to be eaten, with mash, colcannon, or champ. Save the double-entendres for St. Valentine's Day or Boxing Day. On no account should you make references to your shillelagh, unless you want to be beaten with one. 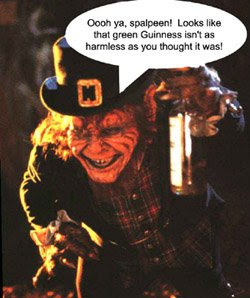 Don't assume that all ginger people are Irish. Many are, but not all. Some are Hungarian. Wearing a t-shirt that says "Kiss Me, I'm Irish" is a sign of sure desperation. With all the drinking that goes on during this holiday, if you can't get someone to kiss you once by the end of the evening, no cheap t-shirt is going to help. "Kiss Me, I'm Irish" knickers are ten times as bad. Don't drink and drive. There's nothing funny about that. * First tip, don't mix up those two. ** Yes, I know the show was "Lord of the Dance" but that's also a hymn. Plus, I'm fairly certain that Michael Flatley's appropriation of the term got him beaten up by more than a few Irish schoolgirls. There was mayhem Saturday (thus the title of this post) at the casting call for the latest series of America's Next Top Model when an overheating car prompted fears of a bomb. 2. Models aren't particulalry bright. If you're watching the programme this year and wondering why so many of the contestants have footprint-shaped scars on different parts of their bodies, now you know why. The puncture wounds are from the stilettos. In related news, the programme has changed the format at bit to keep up with the times. Instead of one-at-a-time walkoffs, the models will all compete simultaneously on stage in a "mob-off." *I sympathize, but I can still change the air filter on mine.